Wheelchair rugby is a sport with national representation at the Paralympic games. The Australian Team is known as the 'Steelers'. Australia has competed at every Paralympics Games since the sport gained full Paralympic Medal status at the 2000 Summer Paralympics. The Steelers also competed in the 1996 Summer Paralympics where wheelchair rugby was a demonstration sport. The 'Steelers' defeated Canada at the 2012 London Games to win its first gold medal. In 2014, it won its first World Championship by defeating Canada. In winning the world championship, the Steelers became the second nation in history to hold both the Paralympic and world championship titles concurrently. The Australian Paralympic Committee currently manages the Steelers high performance program. The sport is not included at the Special Olympics or the Deaflympics. The sport is one of the few contact sports available for wheelchair sport athletes and was originally known as "Murderball". It was developed in Canada during the 1970s and made its way to Australia in 1981. The sport uses a volleyball for the ball and combines elements of basketball, soccer and ice hockey. The game is played on a basketball sized court. Each team has four players on the court at any one time. It has drawn large crowds at events such as the Paralympics. Wheelchair Rugby is open to athletes with quadriplegia. Athletes competing in wheelchair rugby are classified according to their ability. Players are classified using a points system starting at 0.5 for athletes with the least ability through to 3.5 for athletes with the most ability. A team can have four players on the court but must not exceed 8 classification points (the combined total of the player's individual classifications).
. Wheelchair rugby was a demonstration sport at the 1996 Summer Paralympics. George Hucks was a member of the Australian team. During a practice in Atlanta prior to the start of the games, Hucks broke his kneecap. Hucks, from South Australia, was the team's best player. This was a major loss for the team. Hucks was flown home and another player was flown into Australia to replace him. Australia did not win a single match in wheelchair rugby. They lost to New Zealand 23–39, to Great Britain 33–34, to Canada 24–39, to the USA 18–31 and to Sweden 25–29. 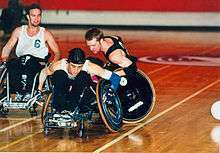 Wheelchair rugby at the 1996 Summer Paralympics for detailed results. The team won the silver medal after losing to the World and Paralympic champions, United States by one point in the final. Wheelchair rugby at the 2000 Summer Paralympics for detailed results. Australia finished 5th in the tournament. Wheelchair rugby at the 2004 Summer Paralympics for detailed results. Three of the team made their Paralympic debut and Steve Porter attended his fourth Games. The Sttelers won the silver medal losing to the United States 53–44 in the final. Wheelchair rugby at the 2008 Summer Paralympics for detailed results. Six players made their first Paralympic Games appearance: Australia defeated Canada 66-51 to win their first Paralympics gold medal. Wheelchair rugby at the 2012 Summer Paralympics for detailed results. Australia defeated the United States 59-58 in double over time in the gold medal match. Wheelchair rugby at the 2016 Summer Paralympics for detailed results. 2014 - AIS Sport Performance Awards - Para Performance of the Year. ↑ "Australian steelers team named for London 2012". Wheelchair Sports Australia. Retrieved 30 May 2012. 1 2 3 "Wheelchair Rugby". Wheelchair Sports Australia. Retrieved 30 May 2012. ↑ "Steelers down Canada to win gold". ABC Online. 10 September 2012. Retrieved 10 September 2012. ↑ "Australia beats Canada to win Wheelchair Rugby World championships". ABC News. 11 August 2014. Retrieved 23 August 2014. ↑ "Wheelchair rugby". Australian Paralympic Committee website. Retrieved 27 August 2014. ↑ Depauw, K. P., & Gavron, S. J. (2005). Disability sport. (p. 141) Lower Mitcham, South Australia: Human Kinetics Publishers. ↑ "Murderball – a great tale of wheelchair rugby". The Roar. Retrieved 30 May 2012. ↑ Depauw, K. P., & Gavron, S. J. (2005). Disability sport. (p. 152) Lower Mitcham, South Australia: Human Kinetics Publishers. 1 2 3 "Wheelchair rugby". Australian Paralympic Committee. Retrieved 30 May 2012. ↑ Golden days of Atlanta : Xth Paralympic Games Atlanta, Georgia, August 15–25, 1996. Sydney: Australian Paralympic Federation. 1996. ↑ Media Guide – Athens 2004 (PDF). Sydney: Australian Paralympic Committee. 2004. ↑ "Australian Paralympic Committee Annual Report" (PDF). Australian Paralympic Committee. 2007–2008. Retrieved 13 June 2012. ↑ Media Guide - 2012 London Paralympic Games (PDF). Sydney: Australian Paralympic Committee. 2012. 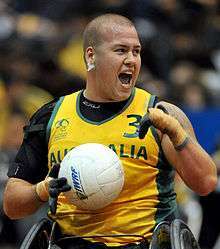 ↑ "Aussie Wheelchair Rugby team announced for London". Australian Paralympic Committee. Archived from the original on 30 May 2012. Retrieved 30 May 2012. ↑ Media Guide Rio 2016 Paralympic Games (PDF). Sydney: Australian Paralympic Committee. 2016. Retrieved 21 September 2016. ↑ Spits, Scott (19 September 2016). "Rio Paralympics 2016: Australia's Steelers record double overtime victory over United States to win gold medal match". Sydney Morning Herald. Retrieved 21 September 2016. ↑ "Australia wins first ever IWRF World Championship". Australian Paralympic Committee News. 11 August 2014. Retrieved 27 August 2014. ↑ "Australia". 2014 IWRF World Championship Wheelchair Rugby website. Retrieved 27 August 2014. ↑ "Steelers settle for silver in Japan". Australian Paralympic Committee website. Archived from the original on 23 December 2015. Retrieved 3 November 2015. ↑ Annual Report 2011-12 (PDF). Sydney: Australian Paralympic Committee. 2012.